There was baking. There was snow. And gym-going. 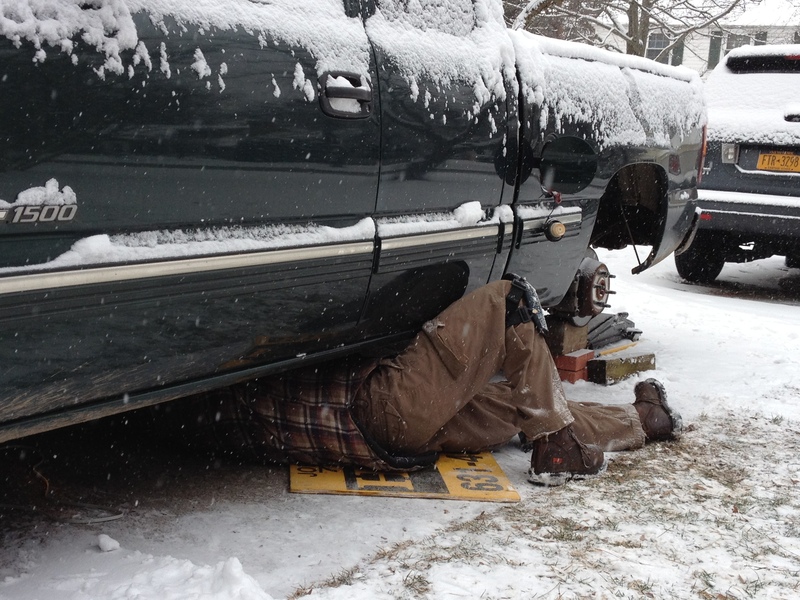 And car-repairing. And cake-tasting. 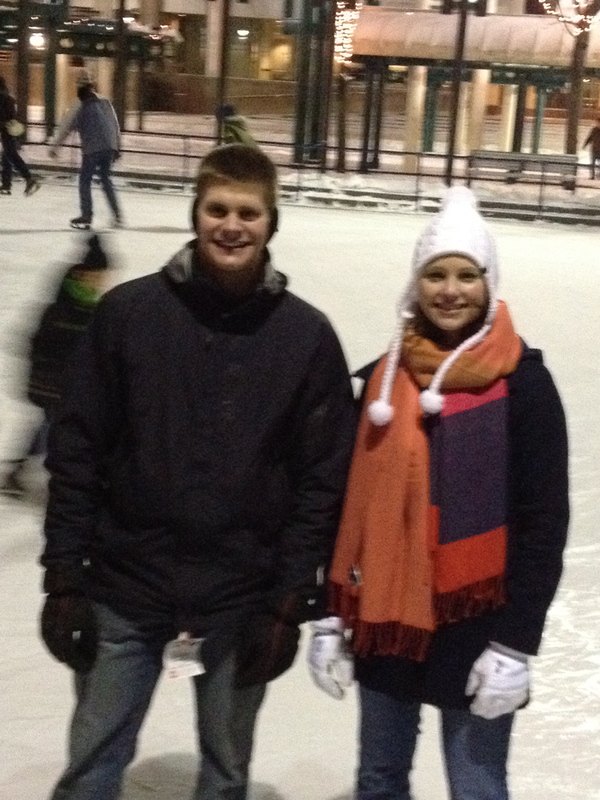 And, finally, a little ice skating. 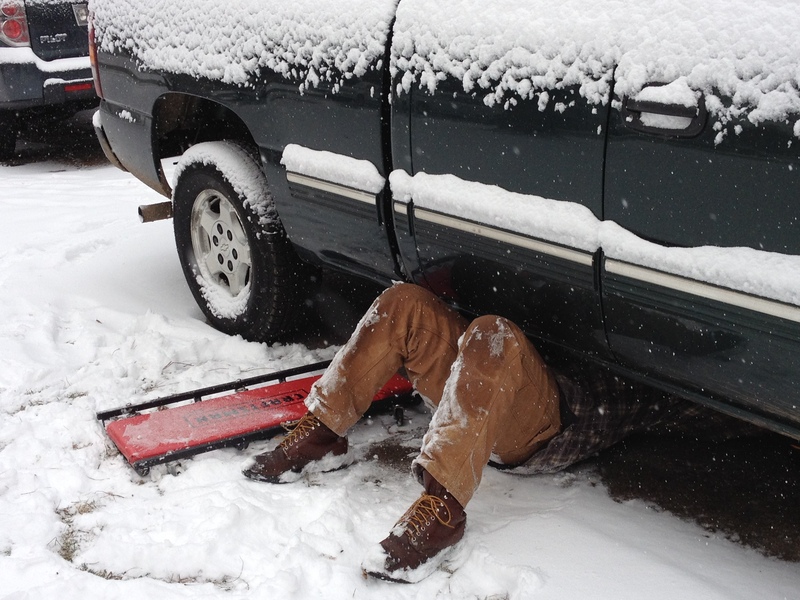 So, after lots of research and You Tube “how to replace a fuel pump” video-watching, Andrew and Bart made plans to replace the part Saturday morning. Company on Saturday morning = BIG BREAKFAST! 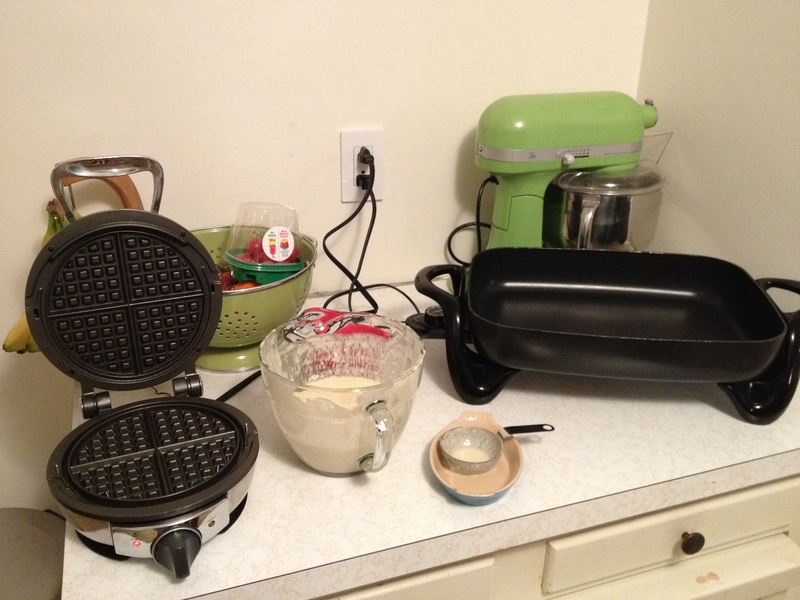 I decided to make pancakes AND waffles (waffles keep better in the freezer) and maple-roasted bacon. 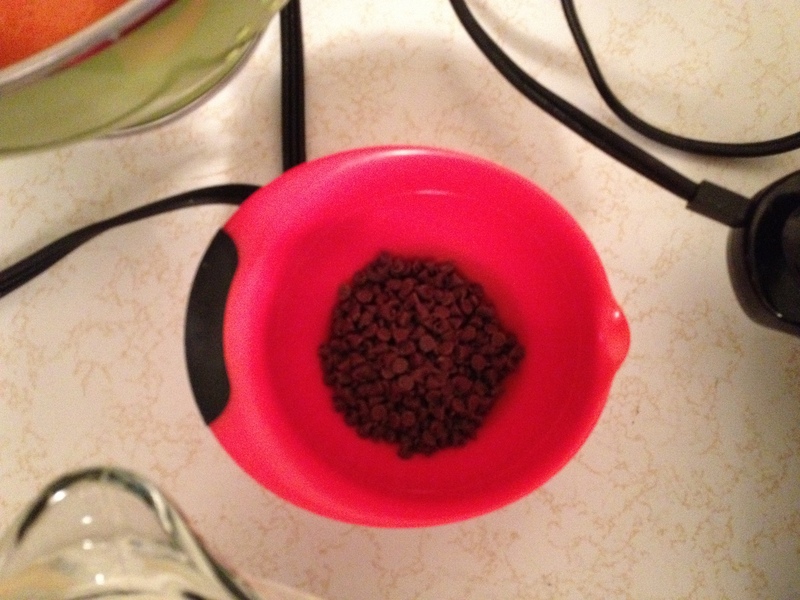 Bart and I like chocolate-chip pancakes, so I added mini-chocolate chips to ours. I even had whipped cream on hand, too–SCORE! 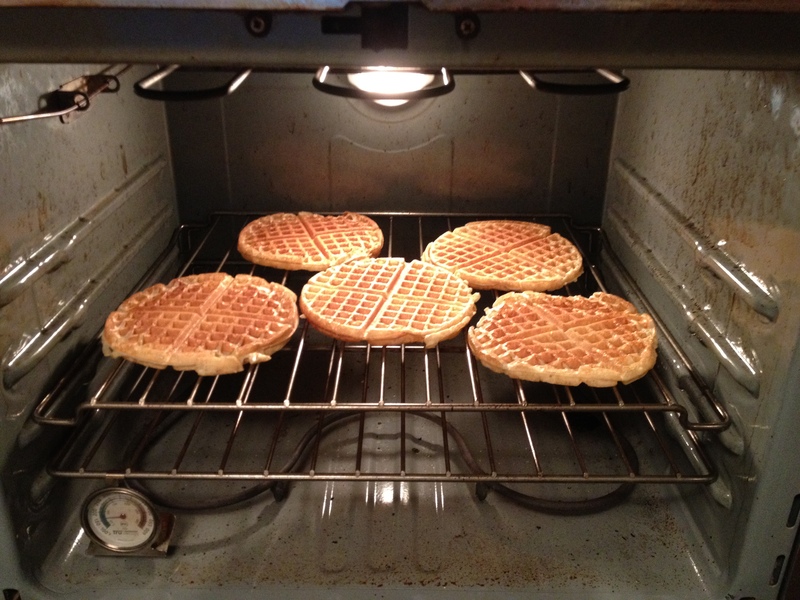 Waffles staying warm in the oven… Side note: I’ve been doing this for awhile now (using the oven to keep waiting waffles crisp and warm) and in just this past issue of Cuisine At Home, someone wrote in and offered this EXACT TECHNIQUE in the reader advice section, and got $100 for it!! Note to self: wrack brain for something to suggest. 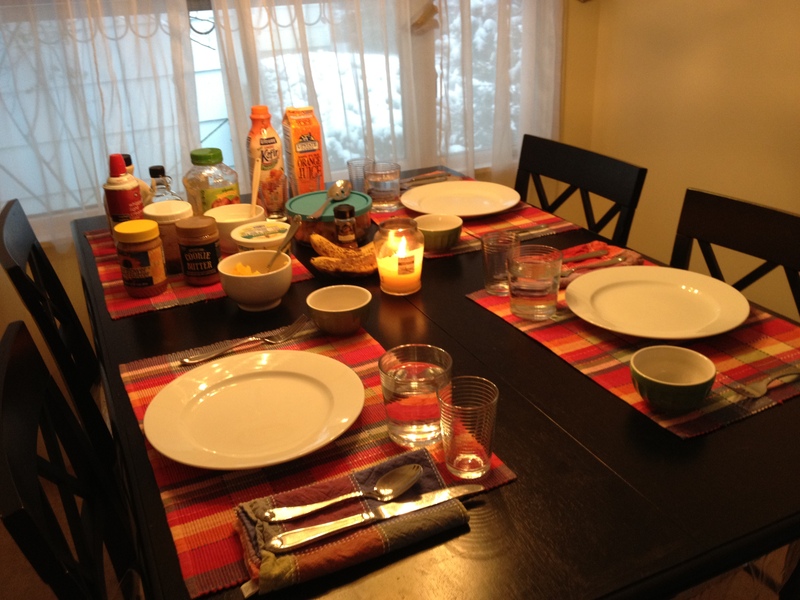 We all enjoyed breakfast before the boys headed outside–did I mention it finally snowed–to start the car project while I tackled clean-up. Look! They’re twins! 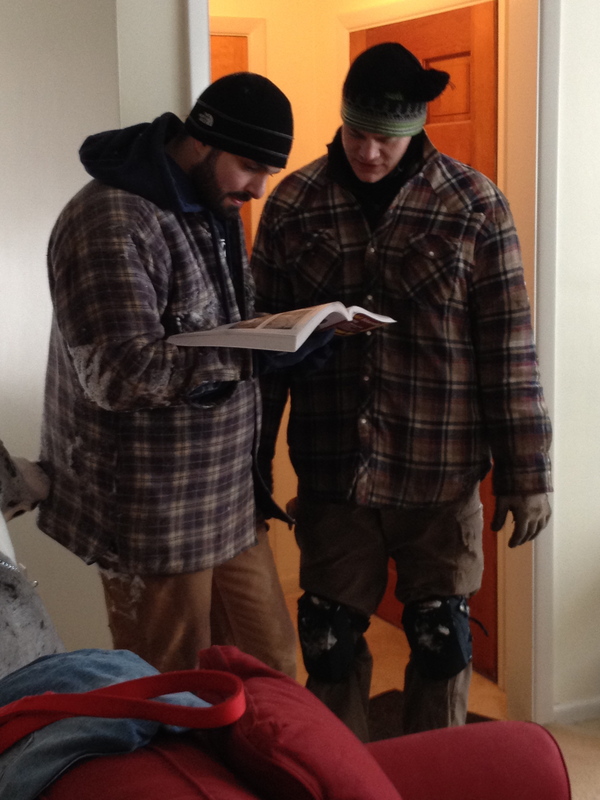 Bart brought over some extra work clothes and gloves (he does this kind of thing a lot), which was nice since the cold weather necessitated multiple layers. …Andrew, who was probably wishing it were just a bit warmer. 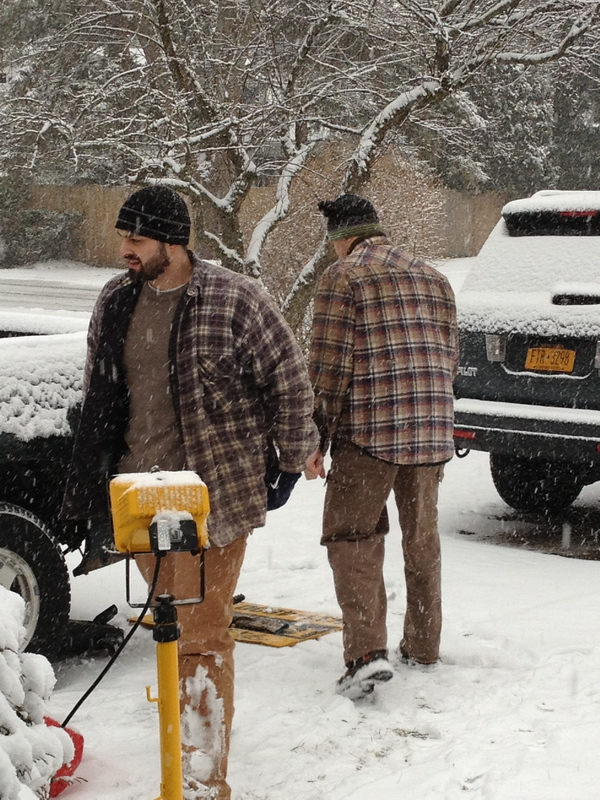 After our mild week, they certainly did not luck-out on weather for the project. After I took a snow-filled walk with the dog and went to the gym for a run, I rushed home to shower and get lunch ready for everyone. Thankfully, I had a great assortment of leftovers (I felt a little guilty serving guests leftovers, but by now, I feel like Bart is almost family, and Andrew’s dad–who had come over to watch the snowy repair job–IS family, and the leftovers WERE pretty special) like homemade coleslaw and roasted potatoes, along with homemade rye bread and sandwich stuff. 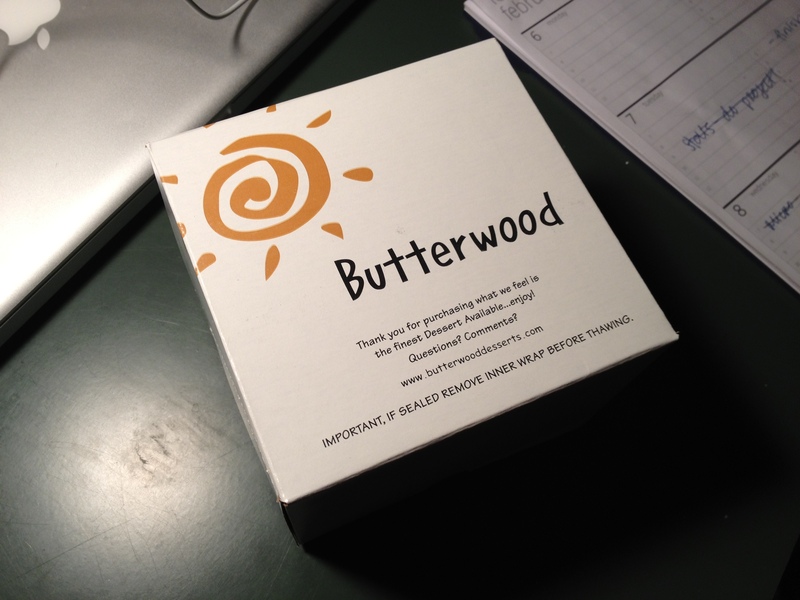 I dashed out the door after my last bit to meet Abigail, Carolyn and Andrew’s mom at Butterwood’s, a local bakery for some wedding cake-tasting! This, of course, would have been a perfect opportunity to take some photos for the blog with all the beautiful cakes and desserts, but, alas, I did not. I really waver between wanting to be a hard-core food blogger and photo-ing EVERYTHING, and on the other hand, trying to not let it take over my life. 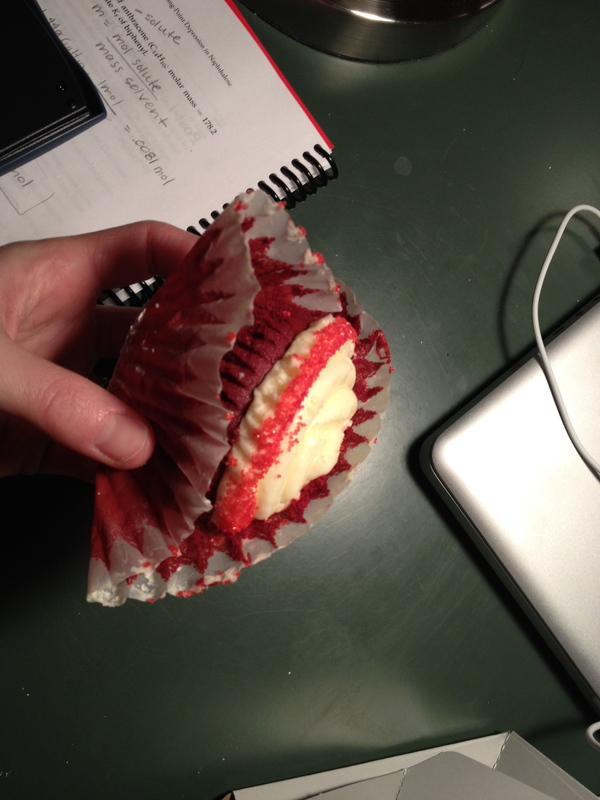 So, no pretty cupcake photos here. 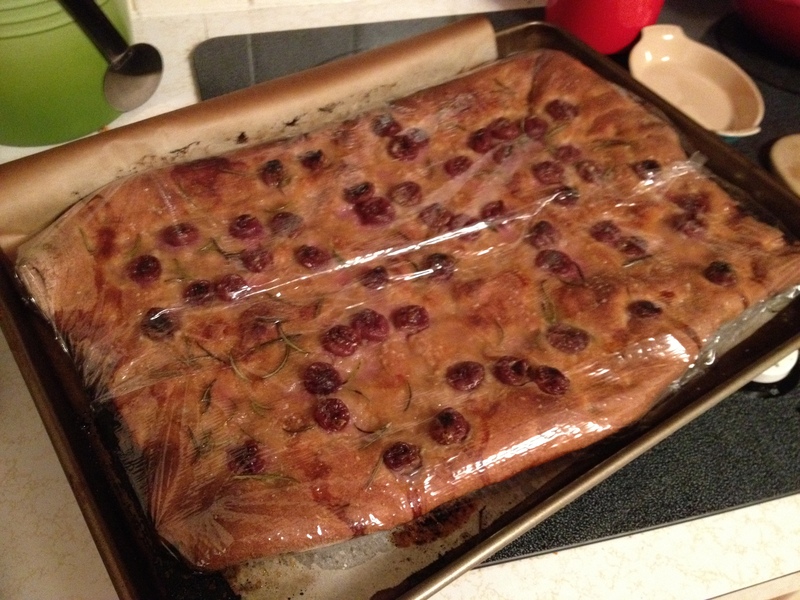 With the sourdough starter that I left out from making the pancakes and wafflers earlier, I made this focaccia. 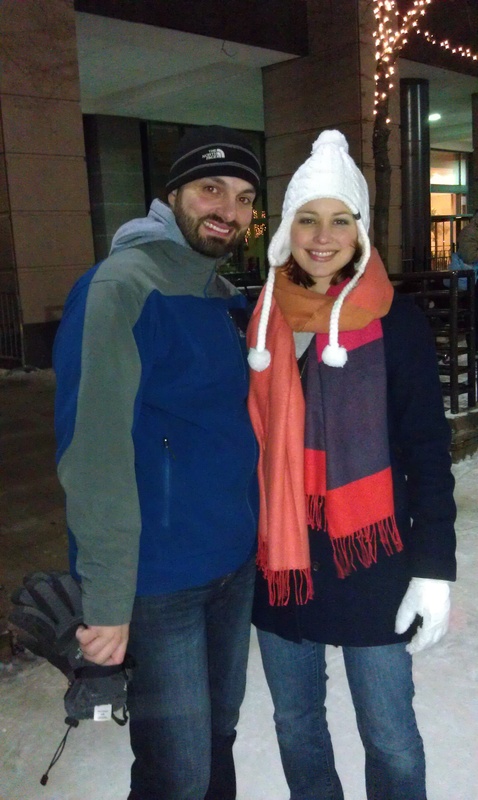 We didn’t end up eating any that night, because Bart talked us into going out with him to ice skate! I so tried to stay behind to do the myriad things on my to-do list (you know, like take a chem quiz, finish two labs, write an article, write two blogs, not to mention a million other things), but at the last minute I couldn’t say no. I threw on some long underwear and ran out the door with Andrew! We headed downtown for some ice skating (there is a free rink on the main thoroughfare in the city) and to check out some of the snowboarding at WinterFest. Don’t you just love my scarf? Andrew got it for me to go with my coat for Christmas–beautiful! I’m LOVING the J.Crew Stadium Jacket we scored on Black Friday… It cinches at the waist and is SO FLATTERING. And it has a hood. I have never wanted a hood more than I have since moving here. After skating, we headed to Pearl Street for dinner, and to warm up! My fingers were just about frozen, despite the awesome glove liners I got recently. I enjoyed their Cherry Wheat beer, some onion rings (really hit the spot), a roasted veggie sandwich and their completely splurge-worthy fries. Seriously, I could really just have their fries for dinner and be happy. Bart recently discovered a new bar downtown that has a trivia night, so he brought us to check it out. 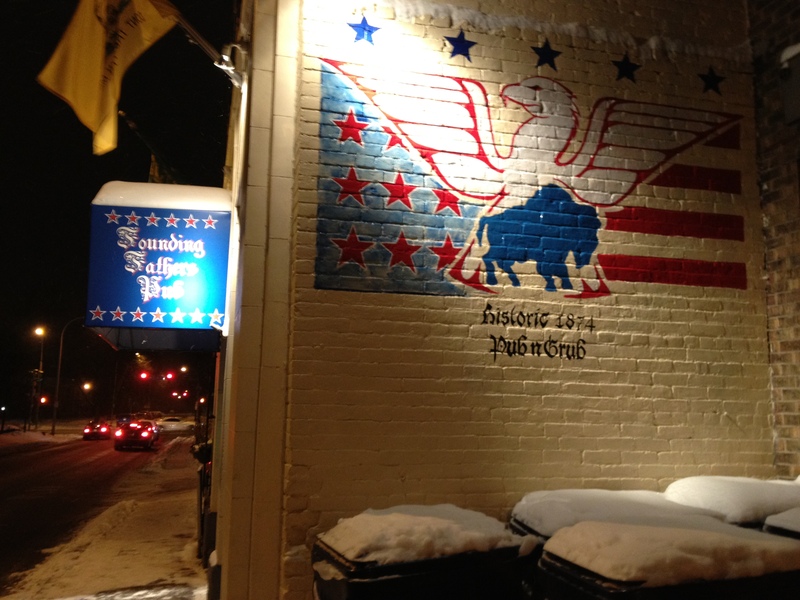 It’s called Founding Fathers and IT IS AWESOME. I mean, the proprietor was wearing a tie–is that my kind of place, or what?! There are flags and U.S. presidential history everywhere–it’s a smart-people bar (I may be a little rusty on my history, but Andrew and Bart aren’t!). Andrew and I have never really felt “at home” (well, who does, really?) at a bar since we choose not to drink all that much, but we (well, really just me, probably) have always wanted to be a “regular” somewhere, and this is the kind of place I could see us going to often. I’m not saying we’re going to go every Friday, but we’d like to give their trivia a try (it’s the first Tuesday of the month), and it just felt like somewhere we’d fit in. Posted on February 12, 2012 February 27, 2016 by thehealthypineapplePosted in Slice of LifeTagged bars, breakfast, Buffalo, cake, chocolate, cooking, Friends, ice skating, waffles, wedding cake, whole grains. This makes me miss you REALLY bad! I don’t know why. It is probably how you paint perfect word pictures and make me wish I was there experiencing it with you! Hugs! Thanks! I needed to hear that… I read it after I got a 76 on my first chem quiz… Grr! And I missed three just because I didn’t get through in time and it timed out! Double-grrrr!